Due to the fact that bison are still predominantly wild and have harder/thicker skulls than beef, bison are stunned with a bullet fired from a high power handgun. Bison are not required to be inspected at slaughter or throughout the process because it is classified as an exotic species. USDA grants voluntary inspection for Bison Carcasses but we need to pay USDA for any inspection services that they provide for bison slaughter and processing. 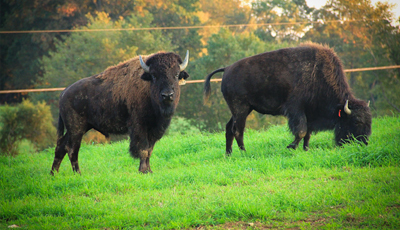 All bison slaughtered and processed at our facility are subjected to USDA voluntary inspection because of the added integrity and safety that it brings to the products. Because of this voluntary inspection, the processing charges for bison are higher than they are for beef. 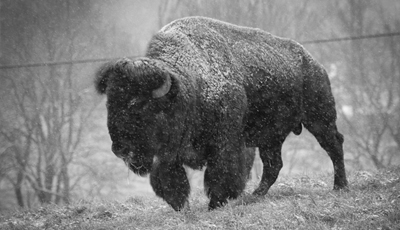 Available for bison carcasses and the first 2 weeks are included with the price to cut & package the carcass. After 2 weeks there is a minimal charge for dry aging and it is calculated based on the dressed weight of the carcass. Please view our policy regarding dry-aging.